Halfway back Michelle’s gonna be all “WE SHOULD HAVE STAYED” but whatever Michelle IT’S TOO LATE NOW. I’m sure your mom is fine. She’s…she’s fine. I’m going to be at Stumptown this weekend! If you’re in Portland, come by and see us! I’m sharing a table with Sfé Monster! Also I have an announcement: Borogove is finally for sale in the store! Click the banner below! Well, Janis didn’t faint, scream, hyperventilate, or try to check herself or Michelle (or Greg) into a psychiatric facility, so sure. She’s fine. P.S. I really like the third panel. Not sure why. Just do. amazing contrast, really! In the fourth panel, I mean.. Janis probably thinks she’s crazy, but at least she didn’t(hasn’t) break down in front of Michelle. Absolutely marvelous page! SUPER excited about borogrove seeing as how I missed the kickstarters! :D Enjoy yourself at Stumptown! Oh, Michelle! Always second-guessing! At least Janis really is taking it better than either Greg’s or Meriel’s parents. I like how she basically held it together for her daughter until after they left. Kory, I was so sorry to read of your loss. You have all my sympathy. Your grandmother sounds like an amazing woman. I actually remember The Gingham Dog and the Calico Cat from my childhood. Not much–it was long ago, but it’s so cool that your grandma drew it! Who’s “my” family referring to? Greg’s? Yeah, considering what machell says afterward. It’s great that you seem to be getting back on schedule! Although this is a simple page with ought much story progress, I have to say, it was worth the wait. Somehow, you just fit so much emotion into it, and I absolutely love that final panel! It’s like you used a disappearance point at an angle or something.Talk later, have fun at stump town! Another truly masterful edition by Monsieur Bing. So much emotion, so much to see in the simple panel (4) of Mrs. Jocasta’s response. And the cat beside her, who just wants to know when she will quit being selfish and make DINNER. What do you expect from a cat, sympathy? LOL. 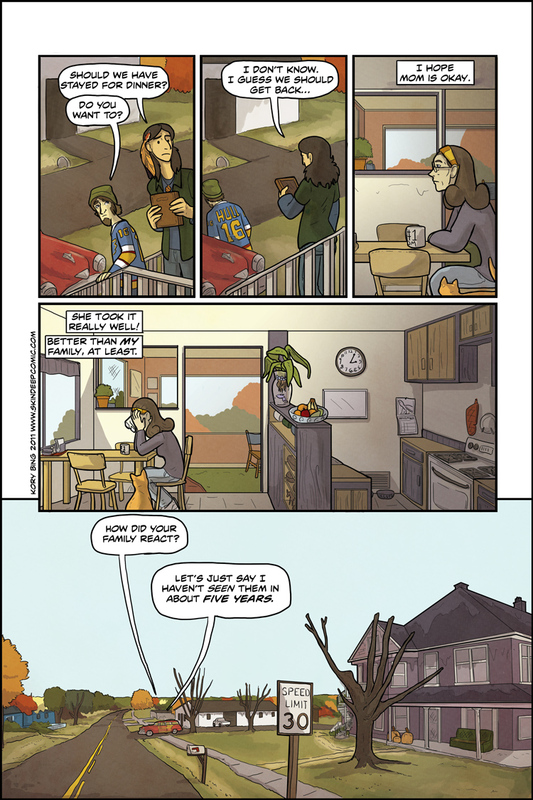 I love the little details you always work into the comic pages, like the turtle calendar, the oven mitt over the stove, the cat’s dish on the kitchen floor, and what looks like trash-bag jack-o-lanterns on the porch in the last panel. These sort of details have me going back to look at past comics over and over. I think you meant Madame Bing. Oops, my bad. Did not know the author was a woman! Sincerest apologies! Neither did I, at fist. Of course,it’s hard to tell with ANY author, especially ones with double- gender names. If you looked on her DA account you could see her picture though, if I remember correctly. Not that that matters either. Or the fact that I said that. Or the fact that I’m typing. I’m getting a bit carried away here aren’t I ? Actually, I did have a cat who offered me sympathy. I knew he was special but didn’t really think about what it was that made him so until I took a philosophy class; the prof happened to note that cats generally don’t have much empathy, while dogs do (some may have more than humans). I realized what made my Rod-beastie special was that he DID have empathy. The 3 I have now really don’t. Yeah, thats another thing I like- you seem to be adding more and more details. It really helps make this seem less and less like a comic. Although, weirdly, there seem to be different styles between micelles side of the story and liverpool’s. It might just be me, but I really hope that I can see when we get michelle to liverpool (remember Ravis? and the store he has there?). Wrapped her furry arms around my neck. I always have had fond memories of that cat. Very nice panel layout. Well done! A friend of mine got his Borogove card deck in the mail from his kickstarter, and I /knew/ I’d seen that name before. That revelation and exclamation brought to you by silly excitedness. Oh, and love the comic. Amazingly enough, Janis looks EXACTLY like my high-school chum’s mother. Michelle, luckily, does not look like said chum or her daughter either, so, thank goodness, otherwise I’d think you were stalking them! Oh and the panel makes wonder if Janis’ expression is either her crying, or just trying to cope with all of it. Finally, the year you post on these comics is 2011, is that to lead us to believe you’re just releasing these in slow succession while you write way ahead, so we’re left wondering? Or is that just a bit of the ol’ copy and paste catching up with you? Jeez, I kind of get why Greg seemed so happy now.